An information infrastructure is comprised of software, servers, storage, and networks, integrated and optimized to deliver timely, secure, and trusted information throughout the organization and to its clients and partners. With the explosive growth in data and information—coupled with demands for projects with rapid ROI—IT infrastructures and storage administrators are reaching a breaking point. IBM® can help with the changes needed to manage information availability, security, and regulatory and compliance requirements on a tighter budget. And because the health of any business often depends on its ability to take advantage of information in real time, a sound, intelligent information infrastructure becomes critical to supporting new growth initiatives. IBM offers an innovative approach to help you manage information growth more effectively and mitigate risks with a dynamic infrastructure that efficiently and securely stores and protects information, and optimizes information access. You can control, protect, manage, and gain new intelligence from your information with the IBM leading-edge Information Infrastructure products, services and integrated solutions, supported by world-class expertise and access to top experts from around the world. 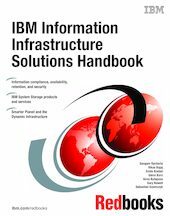 This IBM Redbooks® publication provides an overview of the IBM Information Infrastructure solutions that are designed to help you manage the information explosion and address challenges of information compliance, availability, retention, and security. This will lead your company toward improved productivity, service delivery, and reduced risk, while streamlining costs.